In 1855 William Randell and his wife Sarah landed at Wellington from the sailing ship Belle Creole. They came as settlers from Dorset. William had been a stonemason (a trade that included bricklaying) and Sarah had been in service as a housemaid. Life for country folk in Dorset was a struggle, and the newly-married couple had very little money and few possessions. William and Sarah reached Wellington just after the severe 1855 earthquake had wrecked many buildings and left no chimney standing. At once William’s bricklaying skills were in demand to rebuild the fireplaces and chimneys that were at the centre of every dwelling. The couple were soon settled in a cottage in Ghuznee Street where they started a family that was to grow steadily, as Sarah would give birth every second summer for the next twenty years! Ten years later the couple managed to buy a section halfway up St Mary Street, a plot of land that went right through to Lewisville Terrace. When he found time William levelled the land and, in 1867, began to build the modest dwelling that would become the writers’ cottage. The house was built in ‘settler style’. Two simple wooden sheds gabled at each end were set side by side so that the long inner wall was common to both. Each ‘shed’ had a ridged roof, and the facing surfaces formed a central valley. The front door was in the middle of the east wall, and the back door was set in the centre of the west wall facing the steep Tinakori hill. In this simple four-roomed home the family grew until there were nine children. In about 1874 William added a third ‘shed’ to form two extra bedrooms. When the tenth child was born in 1877, the six-room cottage was larger than most of Wellington’s houses. Later, one of the daughters, Harriet, (a celebrated soloist) taught singing in one of these new bedrooms. 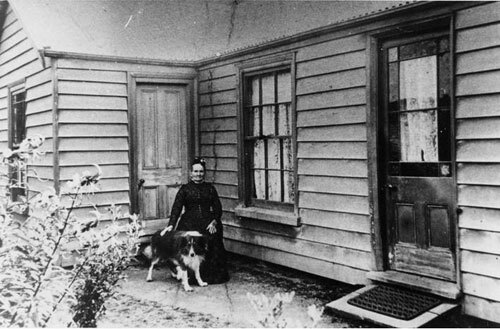 An outer door was added in the 1880s to allow Harriet’s pupils to come and go without needing to go through the rest of the house: the door can be seen behind Sarah in the photograph below. In 1994 the cottage was bought by Beverley Randell, her husband Hugh Price, and their daughter Susan. They restored it with as few changes to the original style and ground plan as possible. The cottage was then gifted to the Trust in 2001. The Prices hope that the succession of writers who occupy it will enjoy being reminded of what settlers’ dwellings were like in the mid-nineteenth century.